Washington, D.C., June 1, 1999 – The relationship between the United States and the People's Republic of China over the fifty years since the PRC was established on October 1, 1949 has been extraordinarily complex. Several years ago the National Security Archive initiated a project to shed more light on U.S.-China relations. The purpose was to obtain critical documentation on key aspects of the U.S.-Chinese relationship, with a focus on the years 1969 to the present. Through Freedom of Information Act requests, collection of relevant publications, and archival research, the Archive has amassed a collection of more than 15,000 pages of previously classified documentation on U.S.-China interaction on foreign policy issues, the U.S.-PRC military relationship, the growing economic relationship between the two countries, as well as documents related to the several issues that divide the countries to this day. In June 1999, the Archive will publish on microfiche with a detailed, item-level printed index, these extraordinary documents, which include policy and research studies, intelligence estimates, diplomatic cables, and briefing materials. Titled China and the United States: From Hostility to Engagement, 1960-1998, this document set is part of the Archive's Special Collection Series, published by Chadwyck-Healey Inc. (Alexandria, Virginia and Cambridge, U.K.), and will ultimately also appear in the Chadwyck-Healey World Wide Web publication of The Digital National Security Archive. Among the highlights of this collection are the detailed (and previously classified) U.S. government accounts of the infamous military assault by the Chinese government on pro-democracy demonstrators in and around Tiananmen Square in Beijing in June 1989. This Electronic Briefing Book represents the first publication in any media of these documents, which include remarkable SITREPs from the U.S. Embassy in Beijing as well as many of the Secretary of State’s "Morning Summaries" from June 1989. In addition to the crackdown itself, the documents also cover the student demonstrations in late 1985 and 1986 that, in hindsight, were signs of the events to come, the period leading up the PLA's use of force, and post-crackdown assessments of the events and their significance. This briefing book was prepared by Jeffrey T. Richelson, a Senior Fellow at the Archive, and Michael L. Evans, a project associate. Dr. Jeffrey T. Richelson (Ph.D., University of Rochester) is the director of the Archive's China and the United States project and previously directed Archive projects on intelligence, the military uses of space, and presidential national security directives. He is the author of several books on intelligence, including A Century of Spies: Intelligence in the Twentieth Century (Oxford, 1995) and The U.S. Intelligence Community (Westview, 1999), as well as articles in a variety of magazines and academic journals. Michael L. Evans (M.A., George Washington University) assists with the China and the United States project, the Archive’s forthcoming Guatemala documentation project, and has also assisted with the Archive’s U.S. Espionage and Intelligence project. The China collection is a breathtaking record of America's long journey toward the People's Republic of China. To "hear" the voices, for the first time, of China's revolutionary icons, Chairman Mao Zedong and Premier Zhou Enlai, cajoling, admonishing and debating American leaders in private, with both sides seeking to out-charm and out-wit the other, will stand as the greatest contribution of this document set. But for researchers and historians, these conversations are sprinkled over a much broader landscape of documentation that provides the larger context of Chinese-American relations over four decades and nine administrations. For Asia hands, this collection will likely prove the indispensable benchmark of primary source documentation for years to come. The Chinese army crackdown in and around Tiananmen Square on June 4, 1989 had an enormous effect on the course of U.S.-China relations. The deaths of democracy protesters resulted in U.S. sanctions, suspensions of high-level contacts, and a halt in the transfer of military technology. The controversy continues to this day, as demonstrated by the reaction of many concerning President Clinton's decision to appear in the square with Chinese leaders during his June 1998 trip to China. The student demonstrations at Tiananmen Square in 1989 were not the first time in the 1980s that Chinese authorities were faced with organized demonstrations expressing dissatisfaction with their rule. In late 1985, and again in late 1986, Beijing and Shanghai were the site of student protests. Students carried banners with slogans such as "Law, Not Authoritarianism" and "Long Live Democracy." In China, a state with significant curbs on free expression, demonstrators have often seized upon politically tolerable causes--such as anti-Japanese sentiment or the commemoration of a popular Chinese leader--as vehicles to gather together and express their dissatisfaction with the policies of the Chinese government. Document 1, a U.S. embassy cable, suggests possible meanings of a tepid anti-Japanese demonstration in Tiananmen Square following a Sino-Japanese volleyball game on November 20, 1985. Embassy officials note that perhaps "someone wanted to stir up trouble to embarrass the authorities," and that "the semi-holiday atmosphere among the students at the square ... points to a lack of fear of retribution." A subsequent cable (Document 2) reports the arrest of 23 of the students who were suspected "ringleaders" of the November 20 demonstration. "The authorities," the cable notes, "knew whom to look for because they had infiltrated both preparations for the demonstration and the demonstration itself." Furthermore, "one armed police installation, shortly before last week’s demonstration, ‘looked like it was preparing for a war.’"
Document 3, a U.S. embassy report from late December 1985, notes that two student demonstrations had occurred in Beijing in the last several days. These demonstrations concerned student issues, the presence of the PLA on campus, as well as nuclear testing in Xinjiang province. The cable comments that "we do find a bit astonishing a demonstration in China ... on nuclear weapons testing." The following December a new round of demonstrations, this time explicitly calling for political reforms, sprang up in China’s cities. Document 4, a U.S. embassy cable from December 24, 1986, reports on a small student demonstration in Beijing on the evening of December 23, 1986. The cable cites an editorial in the People's Daily, the state news daily, expressing sympathy with the students but making it clear that "the limits of official toleration were being approached." Later in the cable, embassy officials note that "political stability has always been a critical consideration in China. There can be no doubt that the authorities will crack down, and crack down hard, if stability seems to be being called into question." Document 5, an intelligence summary from U.S. Pacific Command, reports that thousands of protesters filled Tiananmen Square on New Year’s Day 1987, and that, "Some 24 ‘troublemakers’ reportedly were taken away by the police for ‘education and examination.’" On January 17, another intelligence summary (Document 6)reports that noted reformer and Communist Party General Secretary Hu Yaobang had resigned, apparently "a result of the recent student demonstrations." As the crowds continued to gather in Tiananmen Square in the days following the death of Hu Yaobang, hard-liners in the party leadership prepared to move against both the students and the more conciliatory leaders within the party itself.4 Document 8, a State Department intelligence summary submitted to the Secretary on the morning of June 2, notes that hard-liners "remain unable to resolve the leadership crisis or to remove students from Tiananmen Square." The next day’s morning intelligence summary (Document 9) reports on the first use of force on both sides--with the police firing tear gas on crowds gathered near Tiananmen and the crowds retaliating by stoning the police. The next two documents report on developments at Tiananmen shortly before the PRC employed force against the protesters. Document 10 describes the "unorganized retreat" of a first wave of lightly armed soldiers, and notes that it might have been intended "to prove that much stronger force will be necessary to regain control." Document 11, reporting the advance of more heavily equipped soldiers toward the city center, concludes by noting that the fact that the troops are helmeted and are armed with automatic weapons "suggest[s] that the force option is real." It would not be long after the U.S. Embassy in Beijing warned that the use of force was an option that it began reporting the PLA's attacks on demonstrators. That reporting, as well as information obtained by other means, is summarized in Document 12, a cable from the U.S. embassy in Beijing. The cable notes that troops, using automatic weapons, had advanced in tanks, armored personnel carriers (APCs), and trucks from several directions toward Tiananmen Square. The cable also reports that the American Embassy believed that the 50-70 deaths reported in the foreign media were probably much too low. It also notes that several American reporters "were severely beaten by Chinese troops on Tiananmen Square." As events in Beijing unfolded, the American Embassy provided a near-continuous flow of reporting, based on the accounts of newsmen, residents, and the observations of embassy officials. The Secretary of State’s intelligence summary for the following morning (Document 13) reports that "deaths from the military assault on Tiananmen Square range from 180 to 500; thousands more have been injured." It also describes how "thousands of civilians stood their ground or swarmed around military vehicles. APCs were set on fire, and demonstrators besieged troops with rocks, bottles, and Molotov cocktails." In addition to providing information on the events of June 4, the cables provide dramatic examples of the kinds of intelligence provided by diplomatic reporting. Document 14, an embassy cable from June 4, reports on confrontations between soldiers and protesters, some of which ended in deaths, and vandalism by military personnel, who one source claimed were breaking the windows of shops, banks, and other buildings. On the same day, another cable from the U.S. Embassy (Document 15) reports, among other things, the statement of a Chinese-American who had witnessed the crackdown who claimed that, "The beating to death of a PLA soldier, who was in the first APC to enter Tiananmen Square, in full view of the other waiting PLA troops, appeared to have sparked the shooting that followed." In addition to these eyewitness accounts of the crackdown, other cables (Document 16) also provide information on PLA troop positions and casualty estimates. One section of the Secretary of State's Morning Summary for June 5th (Document 17), titled "After the Bloodbath," focuses on developments in Beijing. It reports that "troops continued to fire indiscriminately at citizens in the area near Tiananmen Square." It also notes the destruction of a large number of military vehicles, threats to execute students, and the potential for violent resistance by students. The intelligence report also provides details on the worldwide reaction to the massacre, noting the unanimous condemnation of the "bloody repression" by foreign leaders, "regardless of ideology." After the square had been cleared Chinese Army troops continued to occupy the city5, with continuing reports of sporadic gunfire and interfactional fighting among PLA units. The possibility that units of the PLA would turn on each other was raised in the June 6th edition of the Secretary of State's Morning Summary as well as embassy cables from June 5-6. An embassy cable from June 5 (Document 18) reports that armored units from the PLA's 27th Army "seem poised for attack by other PLA units," and notes that a "western military attaché" largely blames the 27th for the June 3 massacre, and says that the 27th "is accused of killing even the soldiers of other units when they got in the way." The June 6 edition of the Secretary of State's Morning Summary (Document 19) states that the 27th Army is "being blamed for the worst atrocities against civilians during Saturday night's attack on Tiananmen Square," and also notes that "some clashes between military units reportedly have occurred." Document 20, an embassy cable from June 6, refers to "persistent rumours of splits among the military and fighting among military units." Meanwhile, as embassy officials continued to report on the events on the ground, the State Department went to work assessing the political ramifications of the crackdown. Document 21, the Secretary of State's Morning Summary for June 7, discusses the reaction of Asian leaders to the violence, and reports rumors "that at least some leaders may have envisioned an outcome that would blame most atrocities on the 27th Army, relieve its top commanders, and remove senior officials who ordered armed action against civilians." The June 7 summary also reports that PLA troops had fired shots in the direction of U.S. embassy apartments, an incident covered in greater detail in Document 22, an embassy cable from June 7. It reports that as a PLA troop convoy was passing near the embassy residence, "Heavy automatic weapons fire ... was heard ... Emboffs [U.S. Embassy officials] reported bullets shattered the windows of many apartments in the Jianguomenwai diplomatic compound." An "Uneasy Calm" returned to being by June 8, according to the Secretary of State's Morning Summary for June 9 (Document 23). It reports on missing dissidents, police actions at universities, martial law directives, and the first public appearance of Premier Li Peng since the massacre. Shortly thereafter, the State Department's Bureau of Intelligence and Research published an Intelligence Brief titled "Current Situation in China: Background and Prospects" (Document 24). The document observes that "at the heart of the crisis in China is the power struggle for the succession to Deng Xiaoping," and goes on to analyze the various elements of that struggle. The first appearance of Deng Xiaoping since the crackdown was reported in Document 25, the Secretary of State's Morning Summary for June 10, noting that "Deng Xiaoping’s public appearance yesterday ... signified his endorsement of martial law and the military’s action against the population." The Secretary of State's Morning Summary for June 14 (Document 27) reports on the efforts of the Chinese leadership to demonstrate unity and portray a return to normal government operations, even while continuing the crackdown on the alleged leaders of the demonstrations, reports of which were then appearing in the Chinese press. By June 21, the Morning Summary (Document 29) was reporting that, "More than 1,500 have been arrested ... including at least six of the 21 ‘most wanted’ student leaders." The June 14 Morning Summary and the one for the following day address one of the many problems in U.S.-Chinese relations that resulted from the Tiananmen crisis--the U.S. Embassy's decision to provide sanctuary for Chinese dissident Fang Lizhi in the days following the crackdown. The June 15 Morning Summary (Document 28) notes that the treatment of the issue in the Chinese media indicates that it represents an important conflict of interest with the United States. Arrest warrants for Fang and his wife had been issued by Chinese security forces on June 11 and an embassy cable sent on that day (Document 26) reports that Chinese radio and television announcers had read a "letter" on the air "which accused the US government of supporting rebels and providing refuge for the ‘criminal who created this violence.’"
As the day-to-day crisis atmosphere faded, the U.S. sought to come to a precise understanding of the events and determine how they would affect China's future and U.S.-Chinese relations. Reports based on the accounts of eyewitnesses (Document 30 and Document 31) represent an effort by the American Embassy in Beijing to provide a concise description of the events that led up to the deaths at Tiananmen Square and to "set the record straight." Document 31 is based on the eyewitness accounts of embassy officials, western reporters and diplomats, and U.S. students present on or near Tiananmen Square. In its introduction it notes that while civilian casualties probably did not reach the figure of 3,000 used in some press accounts, "they surely far outnumbered official figures." The body of the cable consists of three parts: a précis of events, an analysis of the extent and causes of military and civilian casualties, and a chronology of developments from 3 p.m. on June 3 to shortly after noon on June 4. A final note states that "Sporadic killing continued at least through Wednesday, June 6." By late July INR analysts continued to update the situation in China under martial law and also had the opportunity to address the impact of the crisis on China. Document 34, a July 26 status report discusses developments since the crackdown. An intelligence research report (Document 35) asks "how did China get to this point?," explores the impact of the crisis on China's domestic and foreign policy, and measures the international reaction to the crackdown. Among the judgments reached is that the situation in China would remain unsettled "at least until Deng Xiaoping and other party elders die." In China, a state with significant curbs on free expression, citizens have often used "legitimate" causes to express dissent in socially acceptable terms. One notion that often has official support is the expression of anti-Japanese sentiment. So it was in November 1985, when anonymous flyers appeared urging Beijing students to stage a rally at the conclusion of a Sino-Japanese volleyball match. While nationalistic in tone, the flyer decried the Japanese "economic invasion" of China and also those Chinese "princes" (a clear reference to members of the Chinese Communist Party) who have risen to power during this time of "uneven development." Although the demonstration was apparently rather tepid, this document points to the possibility that "someone wanted to stir up trouble and embarrass the authorities." Embassy comments also note the curious fact that although the flyer was "not very complimentary toward the Communist Party … the authorities, who clearly know about the call for a demonstration in advance … let it proceed." While the first document downplays the importance of the November 20 demonstration, another cable, reporting the reaction of Chinese authorities in the subsequent five days, draws more significant lessons. In the cable, Embassy officials report information gleaned from an unidentified source that Chinese security forces have detained more than 100 students and arrested 23 suspected "ringleaders" involved in the demonstration. According to the source, "The authorities knew whom to look for because they had infiltrated both preparations for the demonstration and the demonstration itself." The fact that the authorities had been so concerned about controlling the demonstration, the cable concludes, "reflects the extent to which the Communist Party has lost the initiative on campus." Demonstrations again sprang up in December 1985, and students were increasingly bold in their expressions of dissatisfaction with various government policies. In one of the demonstrations, at the Beijing Agricultural University, students decried the stationing of a PLA unit on the university campus. The document also reports another incident, that the cables authors call "astonishing," which involved several hundred students from the Bejing Central College of Nationalities who were protesting the nuclear weapons testing program in Xinjiang Province in western China. Demonstrations again occurred in late-1986, and Embassy reports were increasingly fearful that Chinese authorities would crack down on the students and set back the pace of political reform. The cable notes how the recent spate of demonstrations provoked criticism from the Chinese government who warned that the adoption of "overly energetic methods" to express views could affect stability and interfere with societal functions. The cable also reports the views of several different sources, whose identities remain classified, warning about the possible repercussions for the cause of freedom in China if the students do not proceed more cautiously. One source reportedly told U.S. officials that "the senior leadership was fully focusing on the demonstrations," and that "they had multiple sources of information, including both party and government channels." Another source, in a dinner conversation with U.S. Ambassador Winston Lord, warned that "opponents of political liberalization in the leadership would use the protests to underline the dangers of democracy." The document warns that if the demonstrations become too strident, and particularly if they are staged in Beijing, "then the entire affair could become a net liability for reform with seriously negative policy consequences." "A severe crackdown," the cable ominously concludes, "would be inevitible." Demonstrations continued into January 1987 when 3,000 students defied a government ban and staged a protest in the vicinity of Tiananmen Square in Beijing. This intelligence summary from U.S. Pacific Command notes that 24 "troublemakers" associated with the illegal protest were apparently detained by police for "education and examination." Later that same month, on January 17, 1987, another Pacific Command intelligence summary reported the resignation of Hu Yaobang, from his post as General Secretary of the Chinese Communist Party. An advocate of both economic and political reforms, the summary notes that Hu’s resignation "is probably the result of the recent student demonstrations." After his death in April 1989 students gathered in Tiananmen Square to mourn the loss of a respected leader. What began as a profound expression of sorrow, however, would soon develop into the massive pro-democracy demonstration that occupied Tiananmen Square in the period preceding the crackdown of June 3-4, 1989. By May 20, 1989, with no peaceful resolution of the crisis in sight, the Chinese government declared martial law in Beijing, hoping to intimidate the protesters to clear the square. Nevertheless, U.S. officials were still hoping to see the standoff between the government and the student demonstrators resolved peacefully. Three days after the declaration, U.S. President George Bush met with the Chairman of the Standing Committee of the National People’s Congress, Wan Li, in Washington. While the documentary record is far from complete, this document, a heavily excised summary transcript of their conversation, indicates that the subject of the student demonstrations did come up at their meeting. "The President," the transcript shows, "asked how the Chairman sees the present situation playing itself out." Wan’s reply has not yet been declassified, but he apparently commented on some aspect of the demonstrations, prompting Bush to ask "if this was just a handful of all those demonstrators." Shortly thereafter, Wan cut short his U.S. visit and, on May 27, publicly endorsed the government’s martial law order. On the day before the crackdown began, the Beijing city government tightened restrictions on the foreign media reporting on the Tiananmen Square demonstration, and the Chinese leadership was becoming increasingly frustrated with the persistence of the student demonstrators and their refusal to clear the square. This document, a morning intelligence summary prepared that day by the State Department’s Bureau of Intelligence and Research for Secretary of State James A. Baker (the first of several included in this Briefing Book), discusses these issues and also the leadership crisis facing the Chinese government in the midst of the demonstrations. The summary notes that students expect that the "Goddess of Democracy" statue they erected in the square would "anger top leaders and prompt a response." "The students," the document continues, "may hope an overreaction by authorities will breathe new life into their flagging movement." The initial moves against the students suggested to many that the Chinese leadership was still, as of the morning of June 3, committed to a relatively peaceful resolution to the crisis. This document describes two incidents that in retrospect may have convinced Chinese authorities that the use of force was necessary. The document reports, according to various sources, that "approximatley 5,000 unarmed troops … were turned back by students and citizens as they attempted to advance on foot to Tiananmen Square." Later in the day Beijing police fired tear gas on crowds gathered near the Zhongnanhai leadership compound, but the report suggests that this was an "accidental rather than a premeditated effort to escalate the level of force beyond that used unsuccessfully earlier in the day." With respect to the disorderly withdrawal of the military units earlier in the day, the summary notes that "the obvious confusion of many of the soldiers suggests they were unprepared for the outpouring of opposition their movements triggered." This cable provides fascinating eyewitness accounts of the disorganized and confused retreat of PLA soldiers from the center of Beijing after their advance on Tiananmen Square was halted by crowds of demonstrators on the morning of June 3. The document describes how the soldiers were ridiculed by Chinese citizens and scolded by elderly women who called them "bad boys" and "a disgrace to the PLA." One U.S. official quoted in the document described the events as "a Chinese version of Napolean’s retreat from Moscow." Embassy officials speculate that the soldiers were to have been used to cordon off the square while regular police units would have moved on the crowds with clubs in an effort to clear the square. The document suggests that the episode galvanized the demonstrators, encouraging them to resist further attempts to move them from the square. The tension in Beijing had increased sharply by the late afternoon of June 3 when ten to fifteen thousand fully equipped troops in large truck convoys moved toward the city center. Unlike the previous units, these troops were helmeted and armed with automatic weapons suggesting, as this cable does, "that the force option is real." The document describes the movement of these troops toward the vicinity of Tiananmen Square from several different directions, noting that, "The population appears hostile to PLA movements into the city." By the evening of June 3 the crackdown had begun in Beijing, and the State Department created a special task force in Washington, designated by the heading "TFCH01," to coordinate information on the situation in China. This document, the first in this series of SITREPs, updates U.S. embassy and consular personnel around the world on the first violent clashes with demonstrators as PLA troops "using automatic weapons advanced in tanks, APC’s [Armored Personnel Carriers], and trucks from several directions toward the city center." Casualties, according to the estimates of U.S. Embassy personnel, appear high. The cable also notes that Under Secretary of State Robert Kimmitt had called on PRC Ambassador Han Xu to express "deep regret at the use of force." The violence that occurred on the night of June 3-4 is summarized in this State Department morning intelligence summary for June 4. "Two weeks after martial law was declared," the report observes, "the government again controls the symbolic center of the country." The document describes how civilians turned out in massive numbers and fought for seven hours to prevent the troops from advancing on the square. In the face of overwhelming numbers of heavily armed troops, the summary notes, "thousands of civilians stood their ground or swarmed around military vehicles. APCs were set on fire, and demonstrators besieged troops with rocks, bottles, and Molotov cocktails." 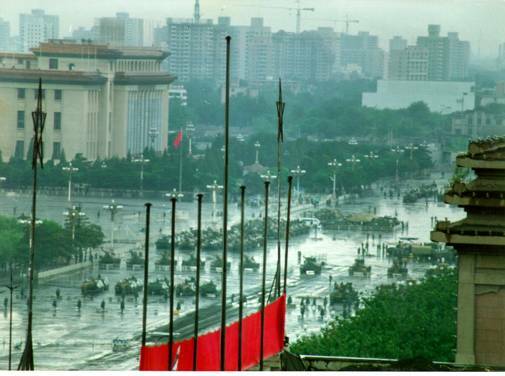 The crackdown continued through the night, and by early morning June 4, as this cable reports, the PLA was in control Tiananmen Square. Based on eyewitness accounts of the violence, this SITREP is the Embassy's initial effort to provide some detail on the final PLA assault on the approximately 3,000 demonstrators who had not yet left the square. "Some 10,000 troops," the document says, formed a ring around the square, and "a column of about 50 APC, tanks, and trucks entered Tiananmen from the east." Demonstrators shouted angrily, the cable states, and "PLA troops in Tiananmen opened a barrage of rifle and machine gun fire." Another column of military vehicles entered soon thereafter, and more gunfire ensued, "causing a large number of casualties." The document also describes violent PLA clashes with demonstrators on Changan Boulevard, the main thoroughfare in the Tiananmen area, and in other parts of Beijing. Embassy officials also report conversations with angry citizens, some "claiming that more than 10,000 people had been killed at Tiananmen." One woman claimed to have witnessed a tank running over 11 people. She also told Embassy officers that she had seen PLA troops "breaking the windows of shops, banks, and other buildings." As the PLA moved to consolidate its hold on the city center in the immediate aftermath of the crackdown, Embassy officials watched closely as tanks, APCs, and trucks passed by the U.S. diplomatic compound, moving west toward Tiananmen Square, reporting these movements back to the State Department. In the space of one hour on the early morning of June 5, this cable reports, "more than seventy tanks moving at a fast speed passed the diplomatic compound heading toward the square." Sources also report the presence of large numbers of burned out military vehicles scattered around the city. The document forwards some early casualty estimates, and also reports on the release of ten foreigners who had been detained by Chinese public security, including several journalists. Most intriguing, however, is a report, attributed to a Chinese-American who witnessed the Tiananmen Square violence, claiming that, "The beating to death of a PLA soldier, who was in the first APC to enter Tiananmen Square, in full view of the other waiting PLA soldiers, appeared to have sparked the shooting that followed." As reports flowed in from the embassy in Beijing, the State Department's China task force was busy updating other diplomatic and consular posts around the world on the situation in Beijing. This SITREP reports the current situation in Beijing where, "The PLA is mopping up isolated resistance," and notes that "casualty estimates vary from 500 to 2600 deaths, with injuries up to 10,000." The cable also discusses the foreign reaction to the recent events, noting especially that, "Taiwan's President Lee Teng-hui called in AIT [American Institute in Taiwan] chief David Dean in Taipei to hear his appeal for the US to join in condemnation and consideration of sanctions." By the morning of June 5 (Eastern Standard Time) the "severity of the assault" had become clear to U.S. officials. This intelligence summary, prepared by the State Department's Bureau of Intelligence and Research, reports that, "Troops shot indiscriminately into crowds of unarmed civilians, including women and children, often with automatic weapons… Foreign journalists report seeing fleeing protesters shot in the back." The document notes the large number of destroyed military vehicles littering the Beijing streets, and reports that an undisclosed entity had "secured a university campus where students had captured an armored personnel carrier, and issued a warning that executions of students would begin tonight." Two days after the crackdown, this report from the U.S. Embassy stated that a western military attaché had told the U.S. military representative that one PLA unit, the 27th Army, "was responsible for most of the death and destruction at Tiananmen Square on June 3." The 27th, the cable notes, was commanded by the nephew of PRC President Yang Shangkun, a noted hardliner, and was even accused of killing "soldiers from other units run over by the 27th APC's and tanks." The document also indicates that a large contingent of soldiers from the 27th had taken up position on a highway overpass, "and seem poised for attack by other PLA units." By the morning of June 6, it appeared to some in the State Department that the situation in Beijing was teetering on the brink of political chaos or even civil war. This Department of State morning summary describes clashes among different PLA units, with sources claiming that in many cases the soldiers were sympathetic with the demonstrators and often complicit in the destruction of their own military vehicles. "At least some of the troops still entering Beijing," the document notes, "are arriving without authorization and are intent upon attacking the 27th Army." The document also appears to be anticipating an intensification of the current leadership crisis, reporting rumors that senior leader Deng Xiaoping has died or is near death, and an attempt on the life of Premier Li Peng by one of his own security guards in the Great Hall of the People. Moreover, Shanghai also appeared to be heading toward some kind of violent military crackdown as PLA troops assembled outside the city, ready to move on striking citizens if necessary. In this document, Embassy officials report continuing large-scale troop movements around Beijing amid persistent but unconfirmed rumors of splits and clashes among Chinese military units near the Nanyuan Airport. The cable also reports the harassment of citizens by troops trying to enforce martial law. By the time the State Department had put together this intelligence summary for the Secretary on the morning of June 7, many of the rumors generated in the past two days we refuted. "Despite numerous reports alleging or predicting clashes between military units in Beijing," the summary begins, "available evidence suggests that few—if any—significant engagements have occurred." Reports of Deng’s death also appear to have been fabrications. The document also mentions that Chinese troops had fired their weapons in the direction of the U.S. diplomatic compound, shattering windows in three of the apartments, and reports rumors that "some leaders may have envisioned an outcome that would blame most of the atrocities on the 27th Army, relieve its top commanders, and remove senior officials who ordered armed action against civilians." This intriguing cable describes a sequence of events that occurred as a large convoy of troops from the 27th Army passed near the Jianguomenwai diplomatic compound and U.S. embassy residences on their way out of the city as part of a major troop rotation. In what was later explained as a search for a sniper, the troops sprayed the compound with automatic weapons fire. One witness, the document notes, "said the unit was from Shenyang and that they had been on the square on the night of June 3-4." The soldiers appeared to be aiming "at or above rooftops, but soldiers lowered their sights (but did not fire) at any spectators who did not cower immediately behind nearby protective cover." The cable explains that the military had apparently chosen to replace "the much-hated 27th Group Army unit" with the 20th in a move "apparently intended to improve relations between the military and the residents of the city." The incident has provoked speculation that the shootings may have been staged as a response to the package of sanctions against China announced by President Bush in June 5, or the decision to grant refuge to dissident Fang Lizhi, an outspoken critic of the Chinese regime, in the U.S. Embassy in Beijing. Five days after the violence, this intelligence summary indicates that, "Numerous arrests can be expected," and that the military appears poised to take over the university campuses. The document suggests that Chinese leaders have initiated a defensive campaign combining mass arrests and detentions with vehement denials that there were heavy civilian casualties during the military crackdown, "focusing instead on attacks and atrocities against the police and soldiers." With regard to the brewing leadership crisis, the report cites a "reliable source" who says that "Zhao [Ziyang] is still in Beijing and in the custody of the hard-liners." One week after the bloody crackdown of June 3-4, State Department’s Bureau of Intelligence and Research issued this brief, explaining the current situation within the context of the Chinese leadership crisis that had been broiling for two years and especially "the power struggle for the succession to Deng Xiaoping." The document suggests that only Communist Party Secretary Zhao Ziyang "seemed to understand the depth of public grievances and the urgent need to address them in some realistic fashion," and that hard-liners in the leadership saw the crackdown as an opportunity to undermine his leadership and restore a more authoritarian government. Thus Deng split with Zhao, his protégé, and "gave carte blanche to Yang Shangkun and Li Peng to enforce martial law and quash the demonstrations." Commenting on prospects for future political reforms, the document asserts that, "There is probably little residual faith that the government can be counted on to move forward on demands for political freedoms, an open and accurate press, and an end to official corruption." On June 9, Deng Xiaoping made his first public appearance since May 16, expressing his support for the military measures imposed on the demonstrations. This document explores the meaning of his speech, and also reports that Chinese authorities continue to round up suspected "counterrevolutionaries" and search for evidence to use against those responsible for the turmoil. The authors comment that although most Chinese leaders blame a small number of instigators for stirring up the population, "that ‘tiny group’ is likely to include thousands of bureaucrats, intellectuals, students, and labor activists." As it became apparent that the U.S. Embassy had no intention of handing over dissident Fang Lizhi, who had taken refuge their on the night of June 5, the Chinese government, in the words of this cable, "stepped up its anti-US rhetoric." Chinese authorities had issued an arrest warrant for Fang and his wife, Li Shuxian, the day before, charging them with "crimes of counter-propaganda and instigation before and during the recent turmoil." The U.S. Embassy was accused of harboring the "criminal who created this violence," and was warned of the potentially harmful consequences for U.S.-China relations. Ten days after the crackdown Chinese leaders appeared to be trying to portray a return to business as usual in Beijing, despite the continuing widespread arrests of students and political activists suspected as instigators of the Tiananmen demonstrations. This document describes the sudden public emergence of many top Chinese officials—including some associated with ousted party chief Zhao Ziyang—in an apparent show of support for the military crackdown. The report also comments that "Beijing’s efforts to sell the official version of recent events and win bureaucratic compliance with the new hardline regime conflict with US attempts to limit repression and honor Fang Lizhi’s request for protection." Policy makers in Washington were clearly concerned as the Fang Lizhi episode threatened to further disrupt Sino-American relationship beyond its current strains. This morning intelligence summary leads of with a discussion of Chinese media reports about the affair, noting that "the article takes care to limit blame to 'certain US personages,' 'a handful of people in the United States,' 'some US media, particularly the Voice of America,' and the 'US Embassy in Beijing.'" The document also reports on fears in Hong Kong over how the colony will be governed after returning to mainland Chinese rule in 1997. "Locals are worried that Beijing could in the future limit civil rights in Hong Kong by declaring martial law or a state of emergency." Washington policy makers also kept close tabs on the continuing crackdown and arrest of persons associated with the demonstrations. This intelligence report leads off with a discussion of recent arrests and executions, noting that, "More than 1,500 have been arrested … including at least six of the 21 'Most Wanted' student leaders." The document also anticipates a Communist Party Central Committee plenum that will ratify the removal of party secretary Zhao Ziyang, and name a new leader. This extraordinary document provides the detailed account of a source who witnessed firsthand the violence at Tiananmen Square on the night of June 3-4. The source indicated that the students had believed that the soldiers would be firing rubber bullets and that "he had a sickening feeling when he noticed the bullets striking sparks off the pavement near his feet." His and other eyewitness descriptions represent an effort by diplomatic reporters to gather evidence about the crackdown and get the story straight. Most impressive in the account is the source’s graphic description of a PLA tank crushing 11 students under its wheels on the morning of June 4. Comments at the end of the document indicate that the source’s version dovetails with the comments of other sources, concluding that, "We find his account of that episode credible. His accounts of other incidents are worth recording as other evidence becomes available." This document, as its authors state in the outset, "attempts to set the record straight" about the events of the night of June 3-4. Contrary to earlier reports in the western media, the cable asserts that many if not most of the deaths associated with the crackdown occurred on Changan Avenue and other streets surrounding the square, rather than on Tiananmen Square itself. The document calls the notion that the military could have suffered more casualties than civilians "inconceivable," but holds that "civilian deaths probably did not reach the figure of 3,000 used in some press reports," but believes that the figure put forward by the Chinese Red Cross of 2,600 military and civilian deaths with 7,000 wounded to be "not an unreasonable estimate." The cable concludes with a detailed, hour-by-hour chronology of the events of the night of June 3-4. This Embassy cable sent three weeks after President Bush announced a package of sanctions against the PRC, informs that a Chinese military official had lodged a formal complaint with the U.S. defense attaché that "strongly protested recent U.S. military sanctions." The document notes that, in response to the military sanctions, the official had canceled the planned visits of U.S. military officials and the discontinuation of exchanges of military personnel and the suspension of visits with the U.S. defense attaché. Embassy officials felt this to be a "measured response to U.S. sanctions," indicating that the official "did not adopt a confrontational attitude and emphasized that both sides should take a long-term view of the military relationship." On June 30, National Security Adviser Brent Scowcroft and Deputy Secretary of State Lawrence S. Eagleburger embarked on a secret mission to Beijing that, according to Scowcroft, was meant to "keep open the lines of communication" between the U.S. and China. This extraordinary document is a list of themes prepared for their meetings with Chinese leaders. The document shows that the administration stressed his personal interest in the maintenance of good relations, and the interest of both countries in continuing strategic cooperation. The Bush administration wanted to make clear that a harsh crackdown a dissidents would make the broader relationship more difficult to manage in the U.S. Although the way in which the PRC deals with those of its citizens involved in the recent demonstrations is "an internal affair," the document stresses that how American people view and react to that behavior is also "an internal affair." Emphasizing the importance of the long-term relationship, the document notes that the president "wants to manage short-term events in a way that will best assure a healthy relationship over time." Document 34: State Department Bureau of Intelligence and Research, "Status Report on Situation in China as of July 26, 1989"
Nearly two months after the crackdown of June 3-4 martial law still prevailed in Beijing with, according to this brief status report, "between 100,000 and 200,000 troops" remaining in the area. This document provides a broad sketch of the bleak situation in China, covering martial law, arrests and executions, the leadership crisis, the mood of the Beijing population, the faltering economy, and China's foreign relations. "Rivalries within the Politburo," the report suggests, "are likely to heighten as the economy worsens and Deng and other party elders sicken or die." This document, an intelligence research report, asks: "How did China get to this point?" The report explores in detail the impact of the crisis on China's domestic and foreign policy, and measures the international reaction to the crackdown. The report also provides brief biographic sketches of China's new leaders including Jiang Zemin, Song Ping, Li Ruihuan, and Ding Guangen. Among the judgments reached is that the situation in China would "remain unsettled at least until Deng Xiaoping and other party elders die." 1 . "It Is Necessary to Take a Clear-Cut Stand Against Disturbances," Renmin ribao (People’s Daily) editorial, April 26, 1989, Reprinted in Michel Oksenberg, Lawrence R. Sullivan and Marc Lambert. Beijing Spring, 1989: Confrontation and Conflict, The Basic Documents. (Armonk, NY: M.E. Sharpe, Inc., 1990), pp. 206-208. 2 .The order, issued by Li Peng, Premier of the State Council, on May 20 stated that, "In view of the serious turmoil in Beijing Municipality ... the State Council has decided to enforce martial law ... so as to check the turmoil with a firm hand...", Beijing Spring, pp. 315-316; On May 24, executive vice chairman Yang Shangkun spoke to the Central Military Commission: "Although martial law has been declared, some of the martial law tasks have in fact not been carried out... We can no longer retreat and must launch an offensive... If any troops do not obey orders, I will punish those responsible according to the military law. ", "Main Points of Yang Shangkun’s Speech at Emergency Enlarged Meeting of the Central Military Commission," Ming pao (Enlightenment) (Hong Kong), May 29, 1989, Reprinted in Beijing Spring, pp. 320-327. 3 .Beijing Spring, p. 401. 4 .On April 25, senior party leader Deng Xiaoping stated that, "Comrade Yaobang was weak and retreated; he did not truly carry through the campaign against bourgeois liberalization... He was weak in the face of bourgeois liberalization... Now the posthumous evaluation is too high." South China Morning Post (Hong Kong), May 31, 1989, Reprinted in Beijing Spring, p. 204-205; Zhao Ziyang, one of Hu’s protégés, chairman of the Chinese Communist Party (and effectively only second to Deng Xiaoping) was also receiving harsh criticism from senior leaders. On May 24, President Yang Shangkun noted that, "Zhao’s attitude was the same as Hu Yaobang’s... The current events are related to the failure to thoroughly carry out the struggle against bourgeois liberalization and the failure to oppose spiritual pollution." Beijing Spring, p. 325. 5 .On June 6, State Council Spokesman Yuan Mu, appeared on television to speak about the "shocking counterrevolutionary rebellion." He stated that "We have achieved the initial--or shall we say first step--victory in crushing the rebellion. The rebellion has not been completely quelled, however... I wish to make it clear that we should not have mercy for those who planned the riots and those behind-the-scenes organizers of the riots, because the contradictions between them and us are of an antagonistic nature." Source: Beijing Television Service, June 6, 1989, Reprinted in Beijing Spring, pp. 363-376. 6 .Bush, George and Brent Scowcroft, A World Transformed. (New York: Alfred A. Knopf, 1998), p. 110; At the meeting Deng reportedly told Scowcroft that "China will persist in punishing those instigators of the rebellion and its behind-the-scenes boss in accordance with Chinese laws. China will by no means waver in its resolution of this kind. Otherwise how can the PRC continue to exist?" A World Transformed, p. 107. 7 .A World Transformed, p. 174. 8 .The Chinese, for their part, had lifted martial law, gave vague assurances on missile sales, accredited a Voice of America correspondent, and had released a small number of detainees. 9 .A World Transformed, pp. 178-179. 10 .A World Transformed, p. 179. 11. A World Transformed, p. 175. 12 . "China’s Growth ‘Justified Tiananmen Crackdown,’" The Straits Times (Singapore), April 11, 1999, p. 19. 13 . "Students wanted democracy: Zhu," South China Morning Post, April 15, 1999, p. 1.